I’ve been tinkering with a Motorola XOOM for the past week or so, and while I like the build quality, speedy processor, and excellent screen, I find that 9 times out of 10 I’d rather just use my smartphone for mobile computing tasks. That’s partly because my phone is always with me, but it’s also because there just aren’t that many apps optimized for Android tablets yet. 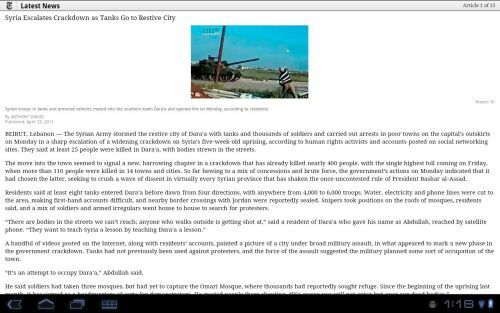 Google Android 3.0 certainly works better on tablets than Android 2.2. The built-in apps, including the web browser, Gmail client, and Android Market make excellent use of the XOOM’s high resolution display and large screen. I’m not in love with the on-screen keyboard, but it’s miles ahead of what you get if you just blow up the Android 2.2 keyboard to fit on a larger device. But while there are well over 100,000 apps available for Android, very few are actually designed to run on Android 3.0 tablets. For some apps, this really doesn’t matter. Games like Angry Birds or Robo Defense look great on a big screen. But many apps that are designed for a 4 inch phone just look ridiculous on a big screen. 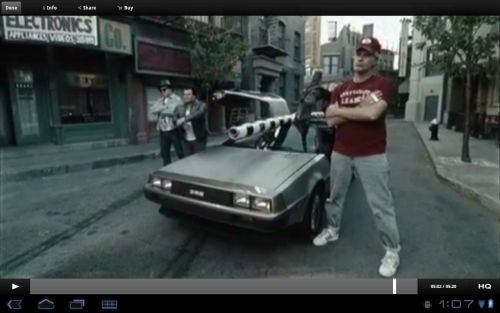 For instance, I decided to take the VEVO music video app for Android for a spin on the XOOM today. VEVO lets you stream 25,000 music videos from over 7,500 artists for free. The video quality looks reasonably good on a smartphone, but even when you tap the HQ button, videos look awful on an Android tablet with a high resolution display. But the bigger problem is that the user interface has clearly been designed for a small screen. When you browse the video selection, you get a list of tiny thumbnail icons and text. On a phone, you’d have to scroll a few times to get to the bottom of the top 12 list, but on the XOOM, there’s extra space at the bottom of the screen. The VEVO app also only opens in portrait mode and only plays videos in landscape mode. I don’t mean to single out VEVO here. 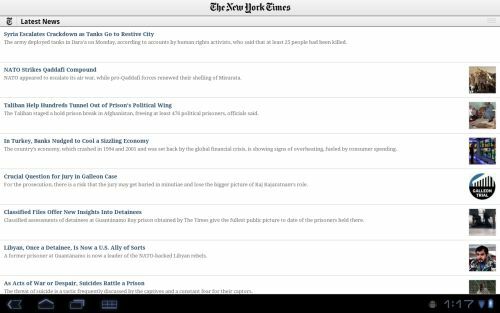 The New York Times app looks awful on the XOOM too. You get too much text and tiny photos. At least you have some measure of control over the font size. The official WordPress app also makes poor use of the screen real estate on tablets, again presenting you with a list view that looks great on a phone, but which doesn’t make much sense on a tablet. Some third party developers are doing things right. The CNN app for Android is optimized for high resolution screens and offers a compelling new way to navigate through online videos. 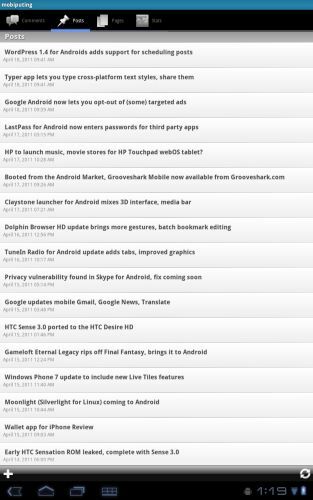 The Pulse News Reader likewise provides an innovative way to view news (although the app isn’t exclusive to Android… the Android version looks nearly identical to the Pulse app for the Apple iPad). 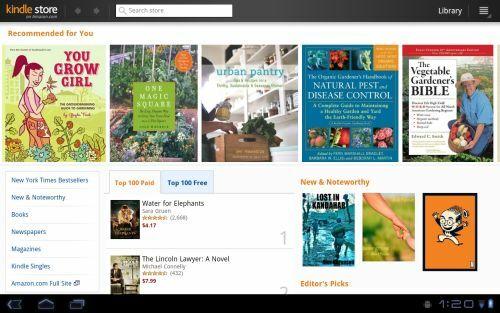 Amazon recently launched a new Kindle eBook app for Android 3.0 Honeycomb which has a much-improved Kindle Store for finding and purchasing eBooks — although the app still really needs a two-pane reading mode for landscape tablets. 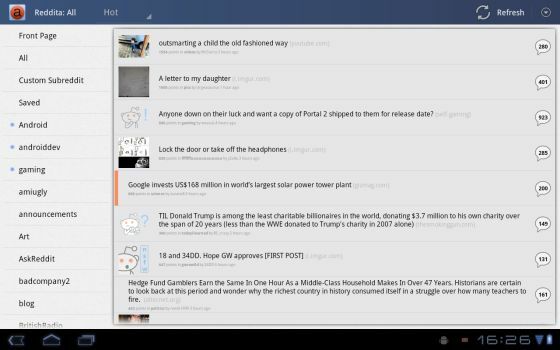 I recently found a nifty app for reading, submitting, and commenting on Reddit articles called Reddita which makes Reddit more fun to use on a tablet than on a desktop computer. Unfortunately these well designed tablet apps are still the exception rather than the rule. There are tens of thousands of iPad apps, but only dozens of apps for Android tablets. There’s certainly a chicken and egg problem going on here. Until more Android tablets are in the hands of users, developers may not want to spend a lot of time and energy creating apps that are optimized for Android tablets. On the other hand, without more high quality third party apps, Android tablets are kind of glorified phones with big screens and better web browsers. That might be exactly what you’re looking for, but are you willing to pay $450 or more for it? Some companies, such as Barnes & Noble are skirting around the issue by creating their own app stores. Sure there are only about 125 apps currently available for the NOOK Color, but at least they’re all confirmed to play well with the 7 inch tablet. Hopefully as more Android tablets hit the streets, we’ll start to see more tablet apps so that third party stores start to look less necessary. Thanks for posting the insight. Brad should pay you for that post. Haha, I won’t hold my breath for that, but I’m glad you found it useful! If it makes you feel any better, she won this contest a few weeks ago. But seriously, great insight. I was hoping to spark some conversation with this post. And I really want to like the XOOM. In fact, I DO like it… I just don’t find it all that useful at the moment. I enjoy following the netbook/tablet/ultraportable scene in general. I still think Asus really started all of this by proving with the original Eee PC 701 (which I owned) that a small, relatively low-powered device with limited storage space and running custom software could still allow us to do most of our daily computing tasks. It’s been a fun ride so far, and I don’t think anyone can predict what will come next! Devices that would have run $1000 or more a few years ago are far cheaper (and more common) today thanks to the netbook revolution which helped consumers realize they didn’t need bleeding edge gaming machines to perform basic computing tasks. Of course, the definition of affordable has gone up and down a bit… as has ultraportable. It’s tough to compare an $829 Apple iPad with 64GB of storage and 3G with a $279 HP Mini 210 netbook, or an 11.6 inch AMD Fusion powered notebook with a Motorola XOOM. But I still see them all as owing a lot to the cheap netbook ethos. Yeah I totally agree… especially right now while there are very very few specialized applications that require any expensive or hardware peformancej to really make them work well. Agreed I’ve got the Xoom right now too, Apps are the issue! But you know what’s really interesting about the Xoom in China? They are launching it with an App Store with nearly 1000 China specific apps. Why couldn’t the US do that? The Xoom might actually stand a chance over here. But the US version is an over priced fail if you ask me! completely agreed, without apps android tablets have much less usefulness.